Her first industry angels were Eugene Harvey and Seymour Flics, then concert promoters, now Whitney's zealous managers and jealous protectors. In 1981 the team devised a game plan: they would develop acting and modeling as adjuncts to the music. Soon Whitney was doing a Canada Dry commercial and TV's Silver Spoons and Gimme a Break. She had already been cutting classes at her private Catholic girls' school to model for the Click agency. She later switched to Wilhelmina and appeared in Glamour and Vogue. Meanwhile she was sharing club dates with Cissy. Finally, at 18, she was ready for the record business. And Clive Davis was ready for Whitney. Earlier, he had helped launch the careers of Janis Joplin, Barry Manilow and Billy Joel. Now he would steer Whitney Houston to middle-of-the-road music. Gerry Griffith, then Arista's A.- and-R. chief, had recommended Whitney to Davis and set up an audition. "Clive sat there poker-faced," recalls Flics. "He said thank you and left. The next day we got an enthusiastic offer." In 1983 Arista signed her, with a "key man" clause: if Davis leaves the company, Whitney can go with him. It took a year and a half for Griffith and Davis to amass suitable songs for the album. Even after elaborate showcases in New York and Los Angeles, many producers turned down the chance to work with her. Finally the songwriter-producer Kashif offered to produce You Give Good Love. Jermaine Jackson, who had emerged from the shadow of Brother Michael, produced three songs. Walden came in to revise and then produce How Will I Know. And Michael Masser covered the pop side of the tracks, producing four of his own compositions, including Saving All My Love and Greatest Love. Says Davis: "Our main criterion in picking each song was 'Will it be a hit?' " The album, budgeted at $200,000, finally cost almost $400,000. The industry rule is to introduce an album with an up-tempo song. Davis took a risk by releasing two ballads as Houston's first singles. "We wanted You Give Good Love to solidify the black base," he says. "To our surprise, it went to No. 1 on the R.-and-B. charts and No. 3 pop. Then Saving All My Love hit No. 1 R. and B. and No. 1 pop. It's ironic, but Top 40 stations give more exposure to ballads by certain black artists than to those by most whites. Whitney is helping to maintain the ballad tradition." The third single, How Will I Know, brought her to the teens and to MTV, which black artists have traditionally found tough to crack. 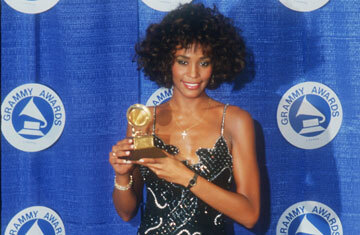 And Greatest Love became Whitney's top-selling single. Says Davis: "It put the album in a totally different category."